Sam Elliott appears in The Hero by Brett Haley, an official selection of the U.S. Dramatic Competition at the 2017 Sundance Film Festival. Courtesy of Sundance Institute | photo by Beth Dubber. Brett Haley is one of the few filmmakers who appears genuinely interested in the lives of people over fifty. He established that vision with his 2015 Sundance premiere I’ll See You in My Dreams, and in this year’s The Hero, he takes another close look at faded glory and second chances. 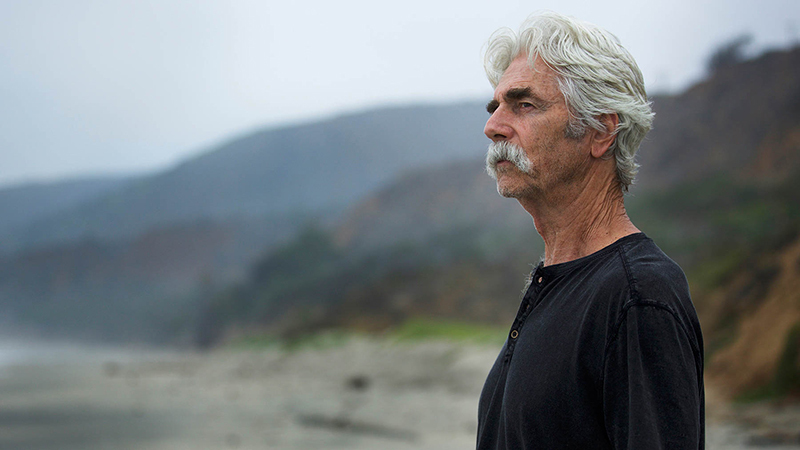 It’s a quiet film with well-placed spurts of humor and vulnerability, and it’s a continuing testament to the acting abilities of the legendary Sam Elliott. Elliott plays Lee Hayden, a once iconic actor who is struggling with his current bout of obsolescence. When he’s not using his smooth drawl for barbecue sauce commercials, he spends most of his time getting high with Jeremy (Nick Offerman), an acting buddy turned drug dealer. The two have perfect on-screen chemistry, and watching them smoke weed and watch TV is actually a viable movie premise in and of itself. All things considered, it’s not a bad life—until Hayden gets an unexpected cancer diagnosis, that is. From this point on, The Hero follows Hayden as he processes this tragic news internally while remaining the easygoing cowboy on the outside. He receives a temporary reprieve from this psychological burden when he meets Charlotte (Laura Prepon), a stand-up comedian who has a thing for old, mustachioed actors. During this time of internal conflict, Hayden also makes a few half-assed attempts to patch things up with his estranged daughter Lucy (Krysten Ritter), who has an unspecified grudge against her father. Outside of a story that feels a bit convoluted, Sam Elliott is fantastic onscreen. At this point in his career, he’s got the sandalwood-voiced cowboy image down—it will really never get old. His performance in The Hero is memorable because of the way Elliott reveals the small weaknesses in Hayden’s outer tough guy. Watching him interpret the lines of a big-budget sci-fi movie as the words that he’s never really been able to say to his daughter is heartbreakingly beautiful. Despite the fact that Elliott makes us feel Hayden’s paternal regrets, the subplot involving Lucy feels obligatory. Between Hayden’s reconciliation with a terminal illness and a sudden reprisal in his popularity, the screenplay just doesn’t have enough room for a broken father-daughter relationship. Speaking of daddy issues, the sudden relationship between Charlotte and Hayden doesn’t quite hit the mark. Casting romantic leads that are forty years apart isn’t necessarily a new development, but it’s a risky move. Today’s audiences are more mindful of how unrealistic it is to envision a world where thirty-five-year-old women are irresistibly attracted to men twice their age—no offense to Sam Elliott, of course. Not only is their relationship hard to believe from a logistical standpoint, but Elliott and Prepon don’t quite have the chemistry to make such an unconventional relationship work.